Game fishing season in full swing. Home | Browse | South Africa | KwaZulu-Natal | Durban | Game fishing season in full swing. Sunrise is getting a little later each morning and most days are hot and humid which is typical for February. We have had rainfall most nights and the result of this can be seen by the dirty water flowing out the port creating a strong colour line. Inshore waters have had cold green water and one need’s to get out to the deeper water to find warm clean water and so some travelling is required to get some fish leaving one with a shorter time to produce. On a short morning trip as we got to the clean water we had a Dorado (Mahi) hit a Rapala Xtreme and after a jump the fish came off. 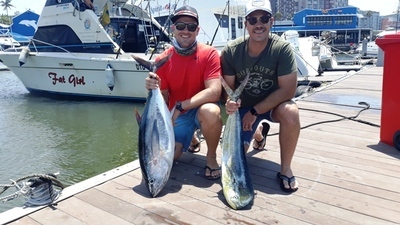 We then landed a decent size Yellowfin Tuna, had an on/off with a Wahoo and then landed a smaller Dorado which gave a fight of a fish twice its size. I think we will start seeing Wahoo catches reported soon and usually when the Wahoo are around we find good numbers of Black Marlin too. Time to stretch those muscles, and prepare for a Marlin fight.